A fun filled week celebrating young children and their families with hands-on collaborative activities encouraging movement and healthy lifestyles through music, food, and art. We invite chapters and members to submit small articles and pictures of your Week of the Young Child activities. Make sure to have parents permission to post any pictures of children. Send to info@iowaaeyc.org or patd@iowaaeyc.org. The Week of the Young Child™(WOYC) is an annual event sponsored by the NAEYC celebrating early learning, young children, their teachers and families. ​The purpose of the WOYC​ is to focus public attention on the needs of young children and their families and to recognize the early childhood programs and services that meet those needs. 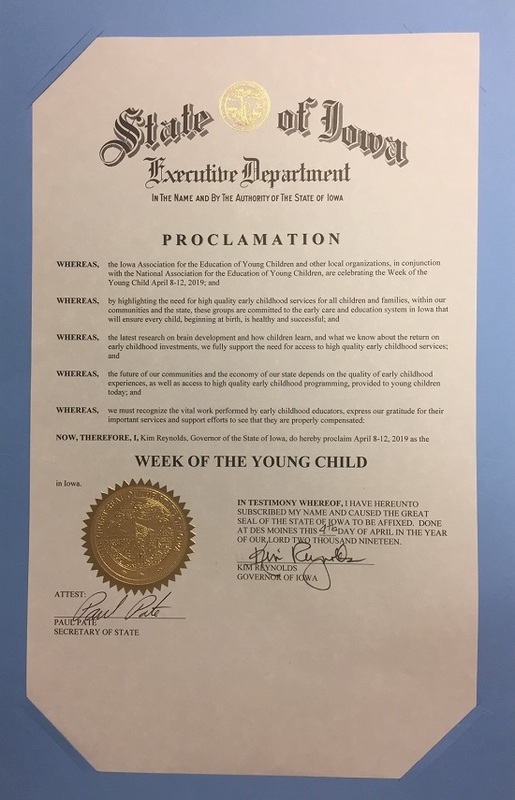 On Thursday, April 4, Governor Kim Reynolds helped Iowa AEYC launch the Week of the Young Child (April 8-12) with a Governor's Proclamation about the importance of the early childhood years.